Palm warbler, photographed in January 2017 at Peaceful Waters Sanctuary, Wellington, Palm Beach County. Palm warblers, Setophaga palmarum, are everywhere in winter. In the cities or in the boonies, odds are pretty good that you'll cross paths with one. By our completely unscientific measure, they are by far the most numerous warbler in South Florida. The key word in the above paragraph is winter. 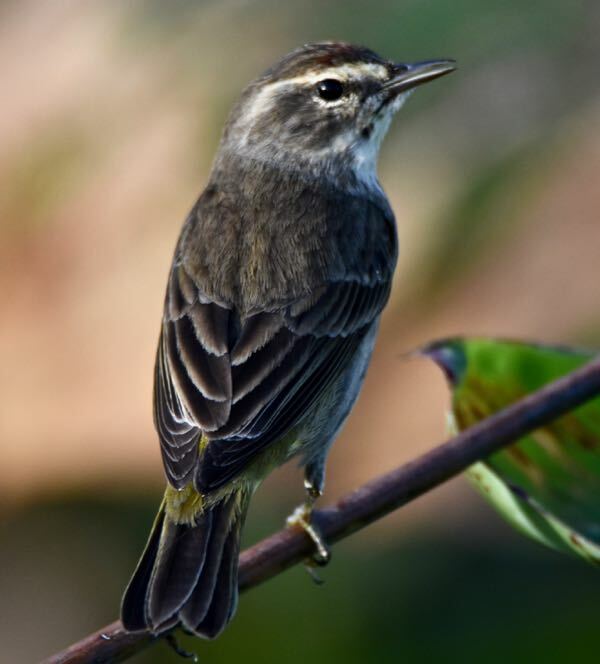 Palm warblers are migratory birds. They spend their summers throughout much of Canada into the Northwest Territories, and the northern tier of the United States, where they breed, then head south for the winter. They'll arrive here as early as September and October and will stay until April, when they make the journey northward. Palms can be found throughout Florida, up the Atlantic Coast into the Carolinas, and along the Gulf Coast to Texas. They also winter in the Caribbean, including Cuba, the Yucatan and into Central America. We've seen them as far south as Key West. Palms are brightly colored in the summer, with a rusty-red cap and a bright yellow belly. However, they're on the dull side during winter when we're most likely to see them. About the only bit of color on them in winter is some yellow near the tail. If you look closely at the top photograph, you'll see a hint of the palm's red cap. They might be confused with a yellow-rumped warbler, but the yellow on the yellow-rump is mostly on the lower back, while the yellow on the palm is mostly below. Click the link and you'll see what we're trying to explain. Other key markings include a dark line through the eye and a light line just above. Palm warblers have dark and light chevrons on their back when their wings are folded. They resemble an enlisted soldier's stripes. Often when you spot one palm warbler, there will be several others nearby. 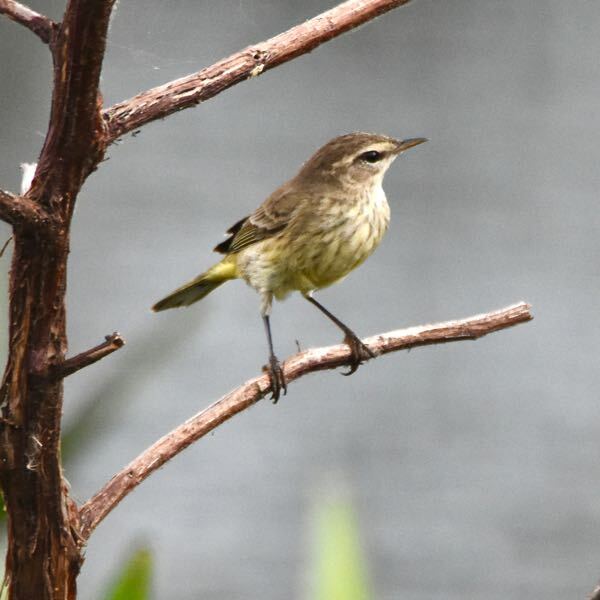 Two behaviorial traits also help ID Palm warblers: they tend to spend more time on the ground than other warblers, and they frequently, almost constantly, flick their tails. 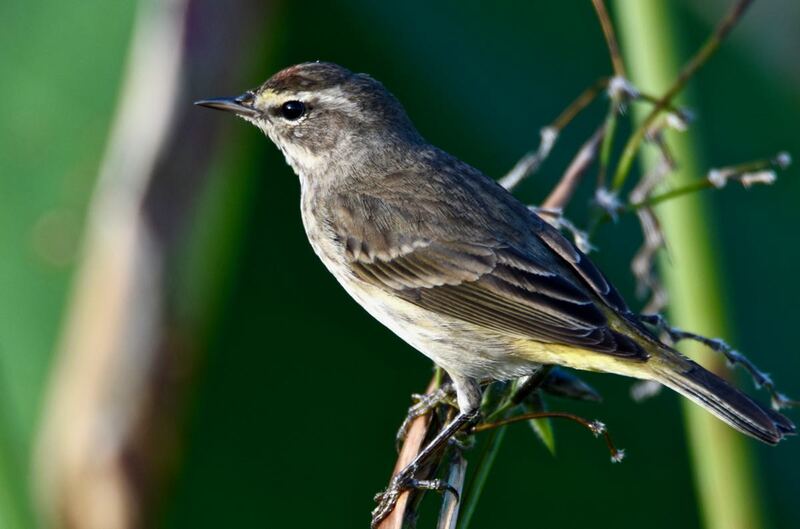 Palm warblers mostly eat insects, but in winter, they'll also eat seeds and fruit. They frequently forage on the ground. Palm warblers are unusual in that they nest on the ground, in a grassy clump near the base of a small tree or shrub. In fact, they are the only member of the warbler family to do so. Their nests are cup-shaped, made of grass and weeds, and lined with feathers and rootlets. The female will lay a clutch of four or five eggs. Incubation time is about 12 days, and both partners split the chore. The young fledge in about about two weeks and can fly distances in a day or two more. There are two types, or subspecies, of palm warbers, the Western and the yellow. Both are found in Florida during the winter. Palm warblers are members of Parulidae, the wood-warbler family.